Solid aluminum body with rounded corners makes it a perfect match to your PC. With a sleek and slim design, it adds seven additional USB ports to your new MacBook and many other devices, allowing you to connect any USB devices to one convenient place, hassle-free and save your precious desktop space. The unibody structure provides for portability while the provided grooved base allows for a fixed position. In addition, the Velcro can enhance the stability. And the green LED indicator reveals power status and hub working status. Support USB 3.0 super speed, rates up to 5 Gbps transmission (much faster than USB 2.0), downward compatible with USB 2.0 / 1.1 specifications. Built-in surge protection keeps your devices and data safe. The 7th port with the charging logo enables fast charges of up to 1.5 amps with BC 1.2 charging-compliant devices, while simultaneously transferring data. 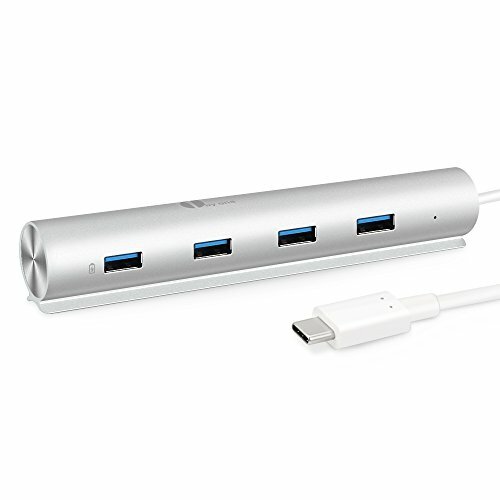 Charge via a power adapter for higher 2.1 amp speeds with all USB-enabled devices when hub is disconnected from an active USB port, or your computer is off or in sleep mode. Dual functions, greatly facilitated. Supports Apple MacBook (12-Inch, 2015), Google ChromeBook Pixel (2015) and more USB Type C Devices. 2.4Ghz wireless devices (keyboards, mouses, etc) may not work around USB 3.0 ports. Try using a USB 2.0 connection.